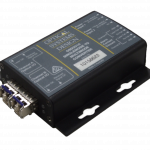 The OSD2254P is an Industrial Self-Configuring Redundant Ring Gigabit PoE++ Ethernet Switch. The OSD2254P has four fixed copper ports all supporting up to 60W PoE each as well as two 100/1000BaseX SFP ports. The OSD2254P will operate up to 75degC with 240W of PoE. Click here for more info.